Compulsory schooling in some Italian States, especially in the Duchy of Milan, dated back to the end of the eighteenth century. Following the legislative proposal submitted by Minister Michele Coppino, compulsory schooling in the whole new kingdom of Italy initiated instead only around 1877, over 16 years later than the unification. Even if the Italian State funding were low, they nevertheless encouraged the construction of new school buildings and imposed new standards. Italian architects showed a great interest in the topic and develop new solutions, sometimes inspired by current European experimentations and publications. Architect Camillo Boito built two schools, both in Padua (1877–80) and Milan (1886–1890), which represented a concrete example of his idea of a new and “national” architecture. 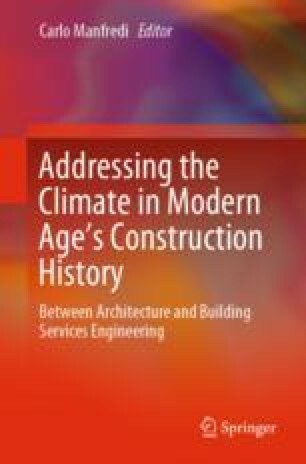 Up-to-date construction techniques were developed and thermal comfort was also improved, according to the standards of that period. The centralized heating systems adopted in the two school buildings testified to the fast development of industry, particularly in Milan, which become the most important Italian center in the sector.